About a month ago I had the opportunity to take a course at a local textiles’ school called Maiwa. 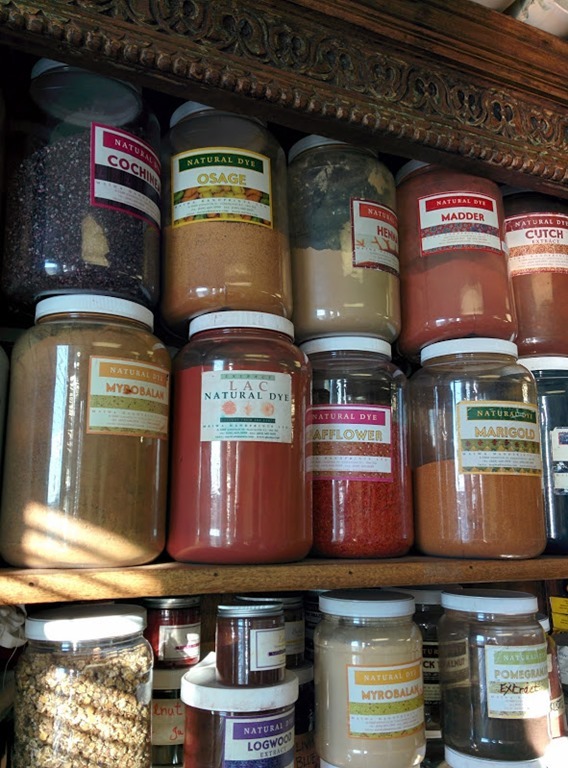 Many fibre artists from the Vancouver, BC, surrounding GVRD and province, and Washington state will be familiar with Maiwa as they have a store front, as well as a supply store, on Granville Island in the Kitsilano area of Vancouver. In East Vancouver, about 4 blocks north of Commercial Drive, is their wet studio/classroom/furniture/supplies store called Maiwa East. 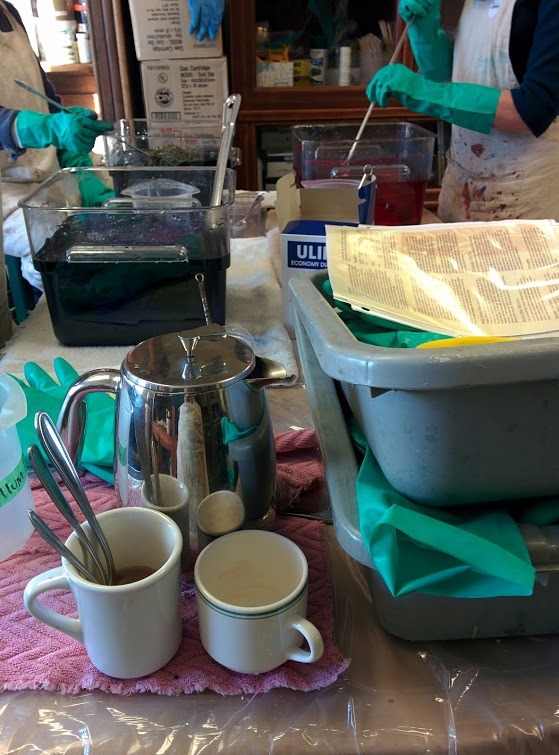 The Introduction to Dyes course was held there and I spent a 3-day weekend playing with natural dyes, cellulose-specific (or cellulose-blended) synthetic dyes and acid dyes. While I have a lot still to learn, I feel like my eyes have finally been opened up to this whole world of dyeing that I have been curious about for so long and haven’t been completely sure how to bridge my knowledge gap. Above :: Natural dye stock in the ‘wet’ room at the Maiwa East studio. 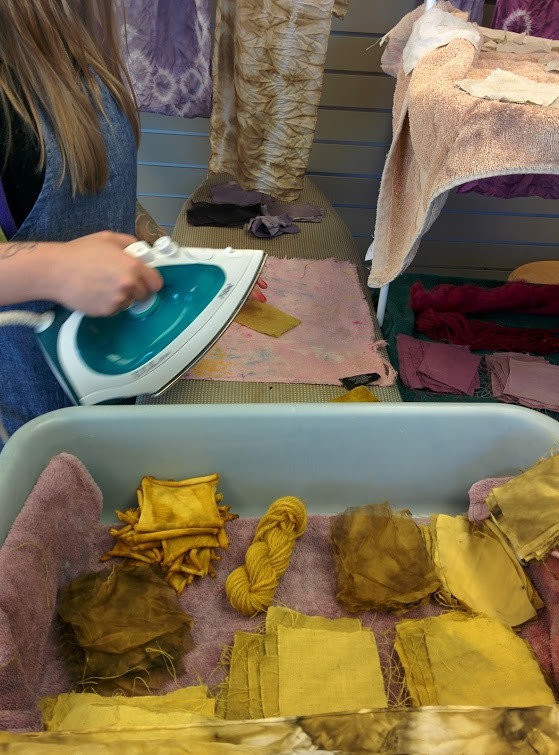 Below :: Ironing samples after dyeing with Marigold. There was rust on one of the clamps used in the pot for some resistance dyeing and it changed our colour slightly from true gold to darker. Something I have learned about myself, which is really important as I learn and grow, is that if I really want to understand something that I feel I have very rudimentary knowledge about, no amount of reading will help me learn. I seem to need to be taught and demonstrated the information in person first, then I have go and read and learn more. I also don’t seem to need a lot of direction – once I’m in front of someone, I seem to be able to pick up on what they are showing me/us as a class and run with it but that initial moment from ignorance to knowledge sharing seems to need to be in person. This was totally the case with spinning. Once I was in front of someone and talking about the process of spinning, reviewing parts of a wheel and drafting techniques, I was off to the races and could learn on my own later, through books and online articles. Of course, YouTube demos are always helpful! Mixing and agitating our samples in Procion MX, which we used on cotton and linen. After the weekend, I was completely drained. Being with people, talking and chatting, and trying to absorb everything Natalie said was exhausting. I enjoyed it very much and while there’s another course I have my eye on next, I’m going to wait a little bit and play with what I’ve already learned. And play, I have been doing. 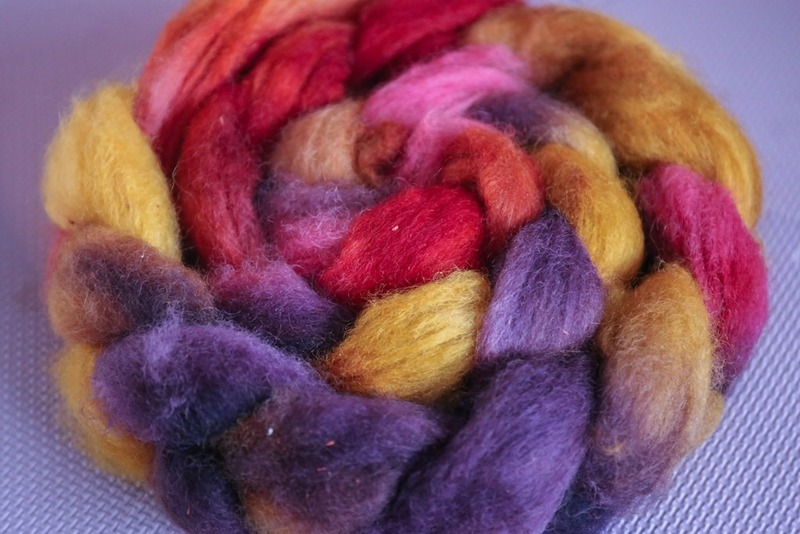 Firstly, I played with some sock fibre from my stash that is a luxury blend of Merino/Alpaca/Nylon/Silk. This stuff feels amazing and while I toy with idea of spinning it up into socks, I’m more taken with the idea of spinning for a shawl. For these results, I played with a dye bath that I added the dye stock to as I wanted. 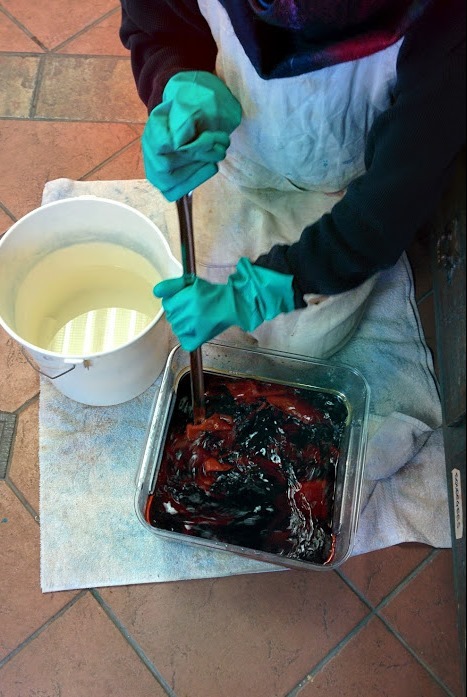 It was kind of a cross between kettle dyeing and hand-painting. The results are softer than hand-painted but stronger than kettle dyeing. I absolutely love them! 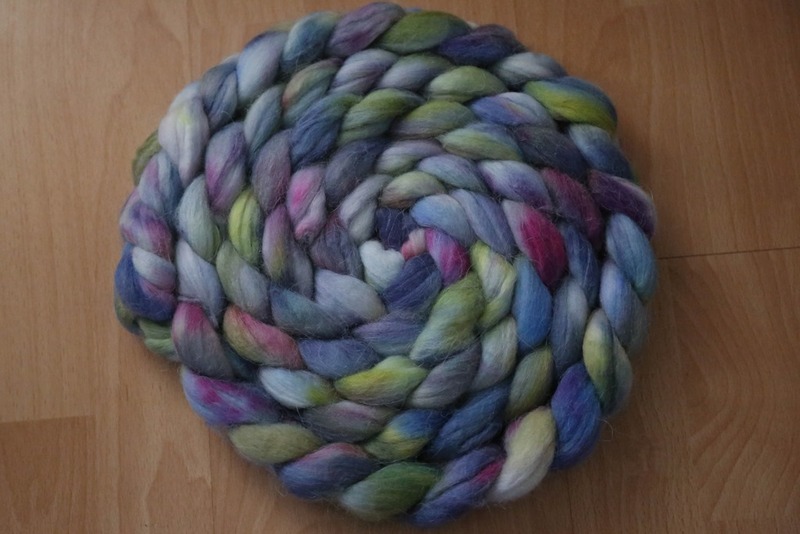 Lastly, and maybe my favourite thing I’ve dyed thus far, is a 1/2 lbs of Romney from my fibre stash. 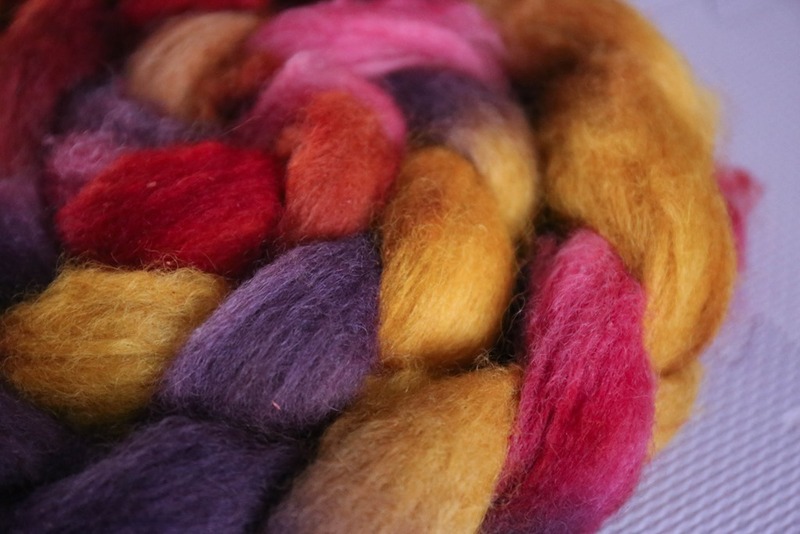 I dyed this by hand-painted natural dyes onto sections of the fibre and steaming it for 60 minutes. To say the results are stunning is an understatement. 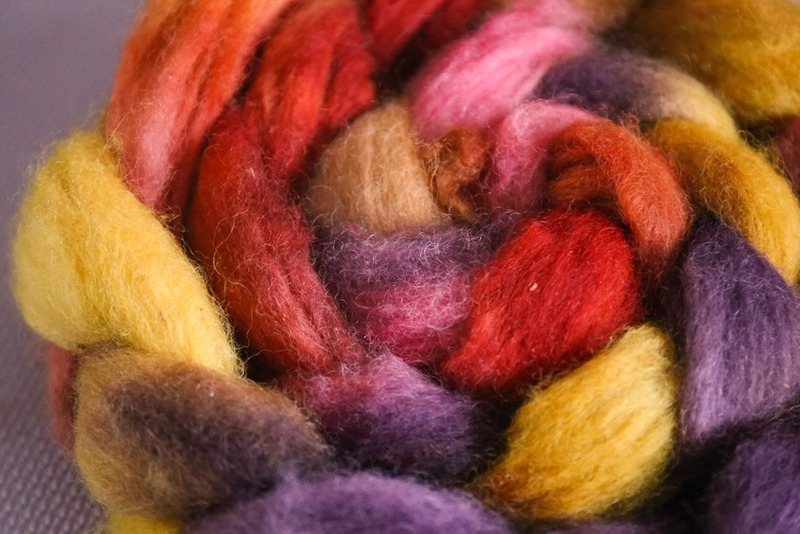 I used Henna, Cochineal, Madder, Logwood and Marigold in the right weight of fibre ratio but with smaller amounts of water than one would in a larger dye bath. They really are this bright in real life! There is still madder and marigold particles in the fibre after drying but it’ll shake out with spinning and prepping the fibre. 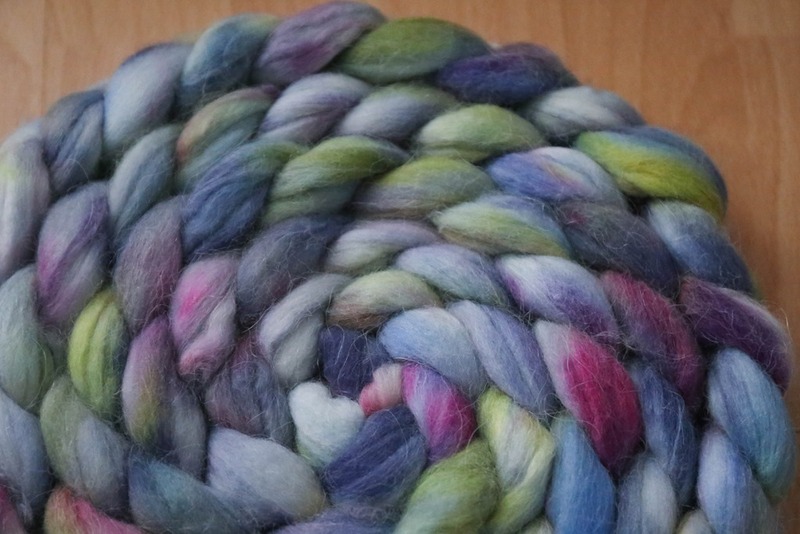 I don’t usually like pink but in this fibre, it’s perfect. I’m excited to see what a traditional 3-ply will spin up as! How do you learn best? What environments have been particularly helpful in creating an optimal learning experience for you? How do you apply that learning best? Absolutely love your colors. Beautiful work. I’m a little jealous. Thanks for sharing.